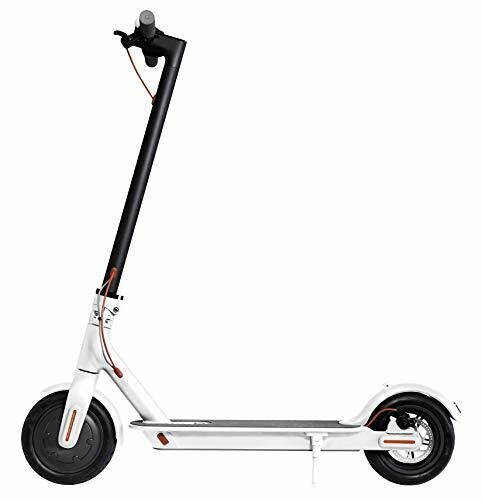 Less than a week after its launch, Xiaomi has started an advertising campaign that arouses the attention of many, if it were not only for the specifications and the price we already know to be quite exceptional, even the design would not seem less. The Chinese company has in fact released new photos of the incoming terminal, immediately after the presentation of the new iPhone XS, XS Max and iPhone XR. In the picture you see at the top, the Xiaomi Mi 8 Youth Edition is depicted next to an iPhone (suppose it is an iPhone X). 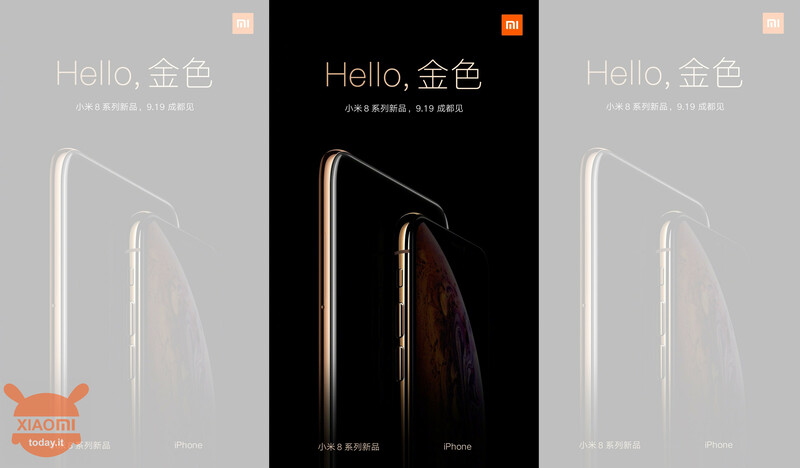 The reason for the comparison is not so much to show how the Xiaomi smartphone has a more interesting design, but more than anything else to let it be known that there will be a Gold version of the device. On an aesthetic level, thanks to the previously leaked posters, we also know that the Mi 8 YE will adopt rear cameras positioned horizontally and not vertically as they were on the original 8 Mi. 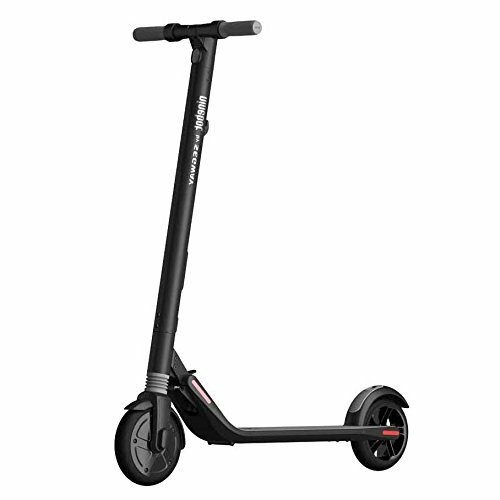 This choice does not bring any real change, but should, at least slightly, make the new terminal distinguish from the dozens of iPhone X clones currently available on the market. From the hardware point of view, the Xiaomi Mi 8 Youth Edition will almost certainly equip a Qualcomm Snapdragon 710 processor, which as you know will bring high performance even if not as a Snapdragon 845, coupled to an Adreno 616 GPU for an Antutu score of about 170.000 points. There will then be at least 4GB of RAM with an option from 8GB, 64GB or 128GB of internal memory, a front camera from 12MP and a battery with a capacity of 3250mAh. The display on the Mi 8 YE will have a diagonal from 6,26 inches and a resolution of 2280 × 1080 pixels, also called Full HD +. 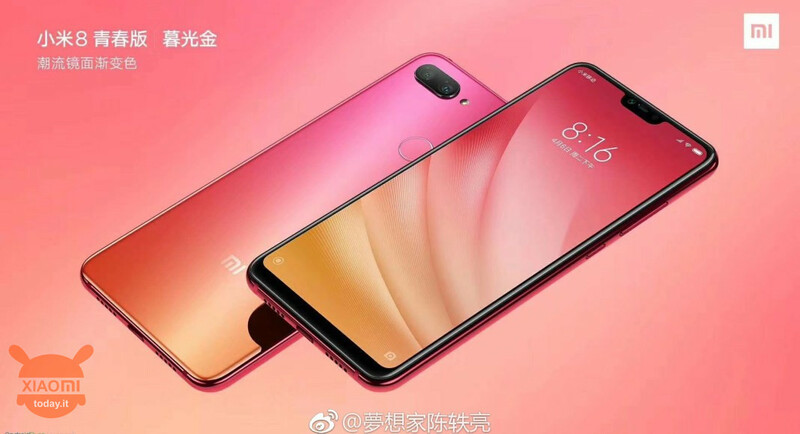 The Xiaomi Mi 8 Youth Edition will be presented on September 19 in Chengdu, China, at the almost unbelievable price of 1999 Yuan, equal to about 250 €.